John Mayer may have become popular thanks to his bubblegum tongue-filled lyrics (I still don’t get what that’s supposed to mean, by the way), but Google is stepping things up a notch in this wonderland-body thingamajig. 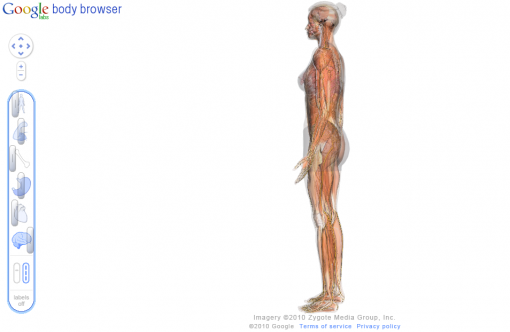 Google’s Body Browser was launched last week and is slated to be another of those Google creations that will keep you playing around for hours – well, maybe minutes, depending on the intensity of your interest in the human anatomy. First thing you ought to know – you need a web browser with WebGL support. Google will try to make it easy for you and give you a link to download the new Google Chrome Beta (you have to admire the plugging). I didn’t have any problems making the application work on the first try, but it seems that in the early hours of its release, some people were not able to make it work. Once you have the new Chrome Beta, just visit the Body Browser page, and you will see something like this. The default 3D image is a fully clad female, which you can manipulate to learn more about the human body. You can peel layer after layer off – not clothing but skin, muscles, and so on. You can also rotate the body and make it smaller or larger, depending on your preferences. I think it’s a pretty cool education tool, but squeamish person that I am, I didn’t last 10 minutes playing around with the 3D model. I am pretty sure lots of other people will find more use for the product, though.